The New York Alfa Romeo Owners Club returned to a familiar venue for its 2017 Winter Party, the Northport Yacht Club. With its comfortable dining area and large bar, it served as the perfect setting. This year, there was something different. That something different however was not found inside the Yacht Club. Rather, it was in the parking lot. New Alfa Romeos, 3 of them, all Giulias. Something our club has been longing for since 1995. The ability to purchase a new Alfa Romeo. Thankfully, that day has arrived. In addition to new cars in the parking lot, we had the addition of new members at the party. An additional benefit of Alfa's reemergence stateside is the introduction of new members to the marque and to our club. In fact, since the introduction of the Giulia sedan, NYAROC membership is up almost 20% ! But let's talk about our event. NYAROC has long maintained a tradition of honoring members of the club that give of their time and serve the club either as members of the Board of Directors or chose to serve on the National Board of Directors. The club has established the "Order of the Serpent" to acknowledge these individuals. However, the club needed to create an award to honor long standing members of our club. With many individuals maintaining their membership in NYAROC for decades, this was a glaring omission. To that end, the "Quadrifoglio Premio" (Quadrifoglio Award) was established. The brainchild of NYAROC Vice President John Catera, the inaugural recipient was a very deserving, long standing member of NYAROC, Mr. Michael Intintoli. Mr. Intintoli is a NYAROC member since 1973. He is a retired mechanical engineer formerly employed by the Sperry Corporation which was a US government military defense contractor. He is extremely knowledgeable and mechanically inclined when it comes to all things Alfa Romeo. He still owns the 1969 Alfa Romeo Berlina 1750 that he purchased new in 1970 and has infected his sons, Anthony and Frank, with the Alfa bug. 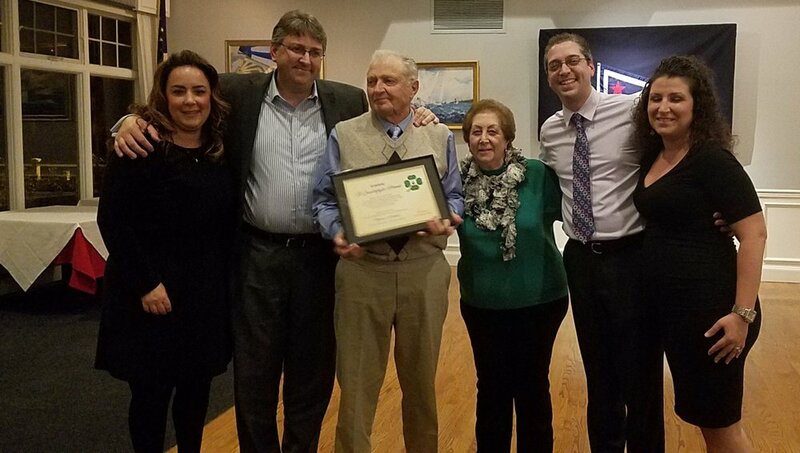 Pictured here with his wife, sons, and daughter-in-laws, it was a great surprise to Mike, and NYAROC was extremely proud to acknowledge one of its longest active members. All in all, with the addition of new cars, new members, and a new award, the 2017 NYAROC Winter Party was a huge success.